If you are like me, you are living hectic lives, trying to balance your spiritual life with your physical life. There are so many sounds and images that assault our consciousness; most of it expressing conflict and dissension across all facets of our life, including politics, religion, social issues, and economic matters. And it's worldwide! We don't have the time nor the desire to know all that we should about these discourses, but every once in a while, there is one particular issue that persists at the back of your mind. It won't leave you alone, and you know you should pursue it; you are supposed to learn something from it. For whatever reasons, I kept coming back to the situation in the Ukraine, and what I have learned has, I think, profound implications for us here in America. 1. Western media outlets are pointing a finger at the disagreement between the European Union and its neighbor, Ukraine, over the latter's deterioration of democracy and the rule of law as the reason that civil unrest has broken out in the Eastern European country. But Ilkiv says the reason that a million people turned out in protest at the end of November has more to do with the total corruption of the government, the burden of over-taxation experienced by the middle class, and the lack of justice and honesty by officials in regard to national security. 2. International observers credited the 2010 election of Viktor Yanukovych as fair and democratic. Since then he has sentenced and jailed his opponent to 7 years in prison, blaming her for allegedly promoting unscrupulous gas contracts with Russia that caused a gas crisis in 2009, and saw Russia cutting the gas supply to its Ukrainian and European customers. President Obama is ignoring the situation, while President Putin enjoys the benefits of the contracts. But the people of Ukraine are the ones who have suffered. 3. According to Mr. Ilkiv, there is an informal vertical power structure that surrounds President Yanukovych, and that results in an imbalance of power. He has established a chain of command, where all power structures, tax agencies, prosecutors and courts are directly subordinated to his will. But that's not all. Some of the most profitable sectors of the Ukrainian economy are under its control. And this power structure has managed to expand its power base into media outlets, which in turn are reluctant to criticize the authorities. The Ukrainians have no independent media sources and rely on the internet to get their truth in the news. But even that is under threat, because Yanukovych signed a law that allows anybody to close any websites without trial or warning because of the slightest complaint. Journalists face enormous pressure and huge campaigns to discredit them, and bodily harm has even come to a few. 4. As you can imagine, if you disagree with this regime, recrimination is the name of the game. The pressure of courts and prosecutors is brought to bear against anyone who dares to speak out; property is confiscated, and a newly signed Presidential act allows a person to be sentenced without his or her presence in the court. Not since Stalin have such tactics been in force. 5. The opposition against the current regime is fractured and ineffective. Three different political factions are vying for the role of opponent in the 2015 elections, but they are either the "old party" of elected-but-discredited; the radicals who want to use violence to push out the regime; or a popular retired boxing champion. 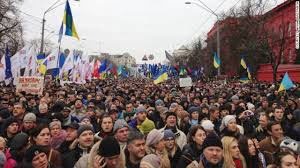 None have a majority of support, and the ineffectual standoff has disappointed the radical faction and resulted in bloody confrontations and riots in the capital city of Kiev. 6. Perhaps the most disturbing piece of information that has come from Taras Ilkiv is the existence of the 'Berkut' special forces, troops that are part of the Ministry of Interior. 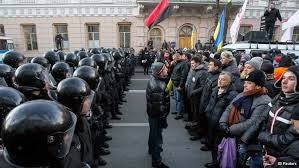 According to Mr. Ilkiv, "Though they have had no official status, they are formed of police officers specially trained to suppress the uprising. Their number is small — only four thousand — but they are particularly severe and receive a good salary for their work." If there is any good news in this state of affairs, it is that Ukrainian forces are reporting that the Ukrainian army has refused to defend the regime of Yanukovych and fight against the people. 7. The good people of the Ukraine have taken notice that the U.S. and the rest of the West are largely ignoring their plight. They do not believe that the West is interested in helping them stand for democratic ideals. And what should be most alarming is this statement by Mr. Ilkiv: "Additionally, there were rumors in the local press that America agreed to give Ukraine to Putin in exchange for increasing U.S. influence in Syria and other hot spots." 8. The Ukrainian people are determined -- and prepared -- to fight for their rights. The protestors have descended upon the Square of Independence in Kiev and brought with them their tents, field kitchens, a stage; they have erected a makeshift hospital, provided private security and even set up an impromptu university. The discipline of the protestors is to be admired. Alcohol is not allowed and they have erected barriers against regime assault. Their actions are telling the world that they are fighting for their future. So, while our media may not be reporting the full extent or magnitude of what is going on in the Ukraine, I think we can get a pretty good picture from Taras Ilkiv's narrative. Sounds pretty scary, doesn't it? And eerily reminiscent of the Arab Spring. America has always stood on the side of freedom, independence and democracy, yet once again we are silent against oppressive governments. Will this be a repeat of the uprisings in Syria and Egypt, and are we seeing the ramifications of another tyrannical oligarchy? What does this bode for the rest of the world? The tactics used by the Ukrainian President sound all too familiar and hit a little too close to home for my comfort. Are you paying attention? I think we would be wise to keep our eyes on Ukraine, and pray for God's justice in the world. Tomorrow, I would like to share with you the bravery of Ukrainian Church leaders in this matter. Oh, that our own faith leaders would be so direct and outspoken! Proverbs 25:26 "Like a muddied spring or a polluted fountain is a righteous man who gives way before the wicked." It's amazing to me how American foreign policy seems so fickle. We let the Czechs and Hungarians swing in the breeze when they stood up to the Soviet Union. And now that history is a source of shame. Reagan came forward and challenged Communism in its face and within 4 years the Soviets were knocked from power. Funny how the Obama-nauts thought that populist uprisings were the thing to support in Libya, Tunisia, Egypt and now Syria, even though Islamic cultures are so very different than our own. America has been involved with the establishment of terrorist governments there, and now is being indirectly supportive of a dictatorship in Ukraine. I am saddened. American foreign policy is unrecognizable to me. Just seems as if nothing is done for the sake of America, and not sure what they're trying to accomplish, or who they are supporting --- actually, I don't want to contemplate who they are supporting, but the evidence is becoming clearer, isn't it? America's foreign policy isn't based on righteousness but on quid pro quo. We support those governments who can give us something. If they have nothing we want they are left to their own devices. I respectfully disagree. If it were truly quid pro quo, we would never have helped overthrow Khadaffi in Libya: he was the guy that got rid of his WMD program and was keeping the Islamists in check. Ditto for Mubarek in Egypt, because he had de-fanged the Muslim Brotherhood and kept the region generally peaceful vis a vis Israel. And I'm not sure what the "governement" in Syria as demonstrated by the (now clearly Al Qaeda affiliates) Islamists fighting against Bashar al Assad can actually offer the US except being a new breeding ground for terrorism. Not a year and half ago, the US State Dept was a big fan of the Syrian Gov't. Sen. John Kerry, now our SecState, had a nice cozy dinner with Assad and lauded him then. Our foreign policy in the last 6 years has been whatever makes the Administration in power look good to their membership. Finally, in terms of "righteousness," we do act that way in good and bad ways. Reagan didn't have to confront the USSR. But he did and the world is a much better place. Bush didn't have to confront Saddam Hussein in Iraq, but he did out of a sense of righteousness...and that didn't turn out so well. Don Rumsfeld was convinced of his own righteousness that the Iraqi people would suddenly break out into democratic bliss (and combined with the ineffective abilities of Amb. Paul "Jerry" Brener & LTG Ricardo Sanchez to actually combine Diplomatic and Military activities there) to a disastrous result. Arguably, I would focus foreign policy on what is good for America: promoting liberty, improving economic opportunity around the world and shutting down governments that threaten their neighbors and/or sponsor terrorism. I don't ascribe to Kissinger's "Real Politik" for what is most expedient within a balance of power, and neither do I agree with the (SecState Colin) "Powell Doctrine of if-you-break-it-you-must-fix-it. The most expedient isn't always the best choice, and I think the radicals around the world would be a whole lot more restrained if they faced a certain scorched earth situation with nowhere to retreat to. If you attack America or Americans, that would be the only quid pro quo I would offer. I like your brand of foreign policy! Our foreign policy, of late, has only shown the weakness of America, not her incredible power and strength; and only served to encourage those who would do us harm. I also thank you for giving us non-military types a thorough summary of the machinations of our foreign policy. Thank you for your service to our country and for your always valuable insight. Can you help me understand the implications for an average Joe like me in the United States? Chris, read it again carefully, and see if you can't connect some dots in comparing what is going on in our own country. And then if you have a specific question, I'll be glad to respond.